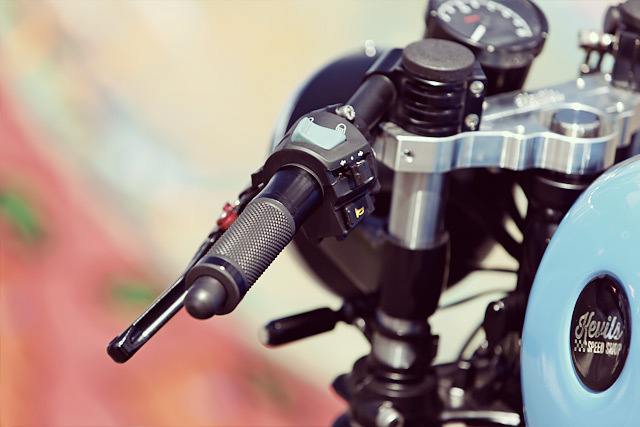 As the custom bike scene becomes increasingly crowded, builders constantly try bend, break and make something that’s going to turn people’s heads. There’s genre-defying builds, customs built on increasingly unusual base models and all manner of gaudy paint schemes and odd angles of fabrication designed to get exposure on websites like Pipeburn. Because of this, sometimes you need a build that’s just straightforward enough to remind you how good a simple, tight café racer can be. 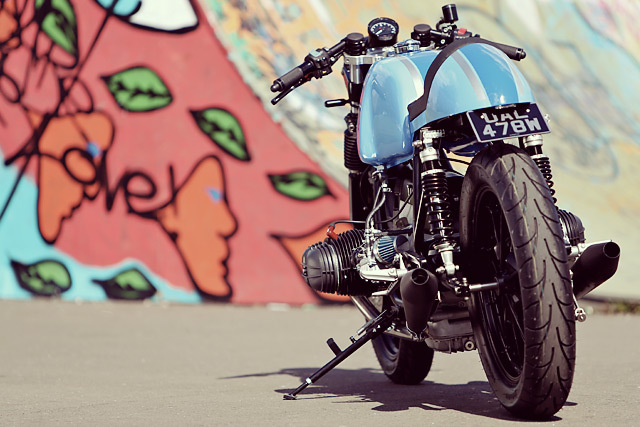 Devon-based Kevil’s Speed Shop help remind us of how effortless a bespoke ride can look with their 1981 BMW R80 café racer dubbed ‘Jellyfish’. 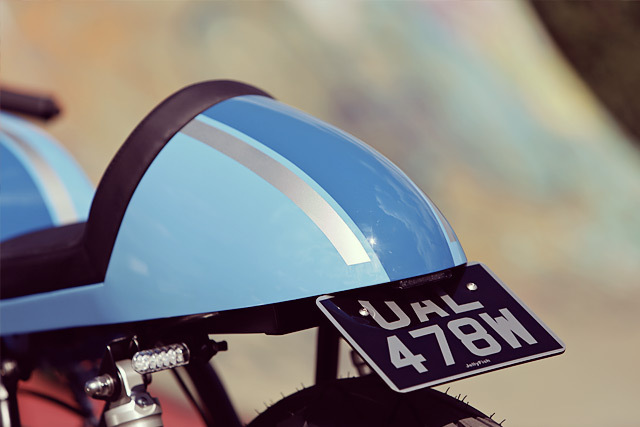 Kevil’s has been kicking along nicely for several years now, producing a stable of bobbers, café racers and bratstyle bikes for a host of customers across the UK and Europe. 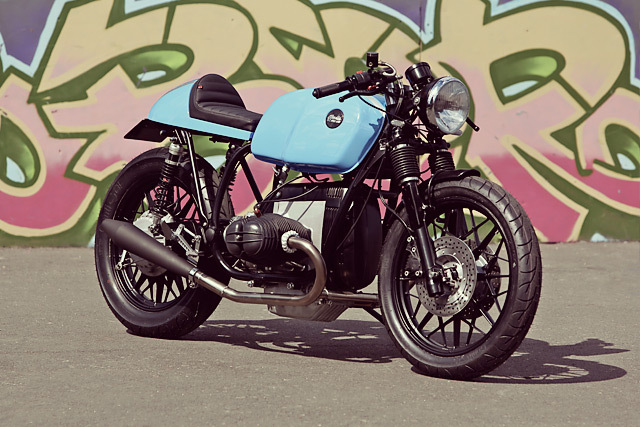 A click through their website reveals a distinct preference for old BMW boxer twins, with the workshop having gotten their hands inside more airheads than a college quarterback. And this time around, such specialization put them in good stead when struggling to complete the ‘Jellyfish’ in what they describe as record-breaking time. While the team was on ferry bound for ‘Wheels and Waves’, a gathering of incredibly cool bikes and moto art in the south of France, they received a request from an unusual source. The call came from a Vineyard in the North of Italy, where the owner, Francesca, had tasked her PA with the enviable errand of commissioning a café racer. And quickly. Francesca wanted the bike ready for the Italian summer shutdown, the annual period where Italians take time off eating, drinking and sleeping at work to eat, drink and sleep at home. 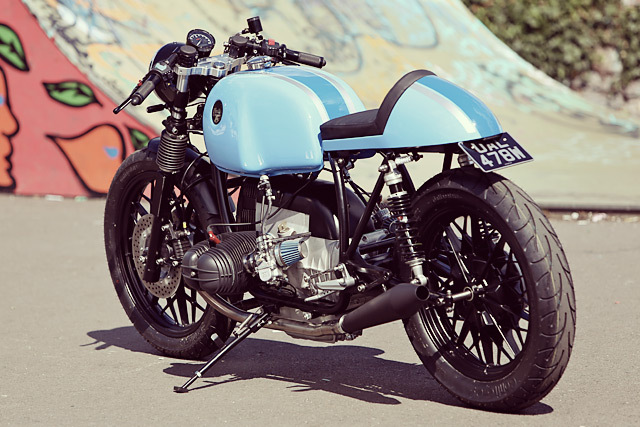 The team at Kevil’s had only six weeks to design and build the bike. As soon as the team landed back in rainy Devon from Wheels and Waves they set about planning the build. The owner of the workshop, Kevin Hill (Kev Hill – Kevils – geddit? ), discovered the benefits of working with the one marque of bike. ‘We already had a donor in stock all stripped down. 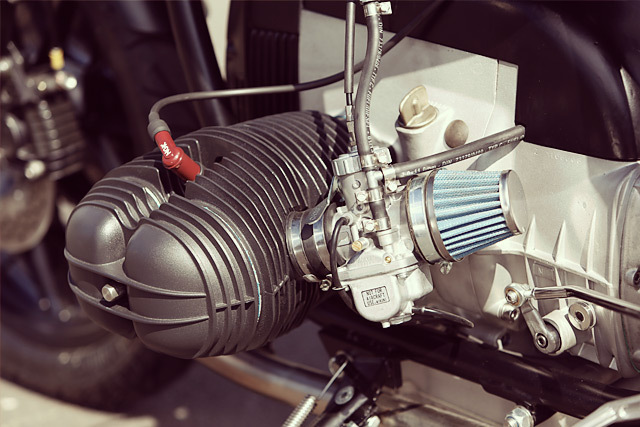 The engine, transmission and diff were already refurbished and sitting in a shelf.’ So all that was required of the team at Kevil was to do the… well, the everything else. As you’ve probably gathered from the refurbished running gear of the BMW, the team aren’t really fans of cosmetic-only restorations, and they pride themselves on the complete tear down and renewal of as many parts as practicable. 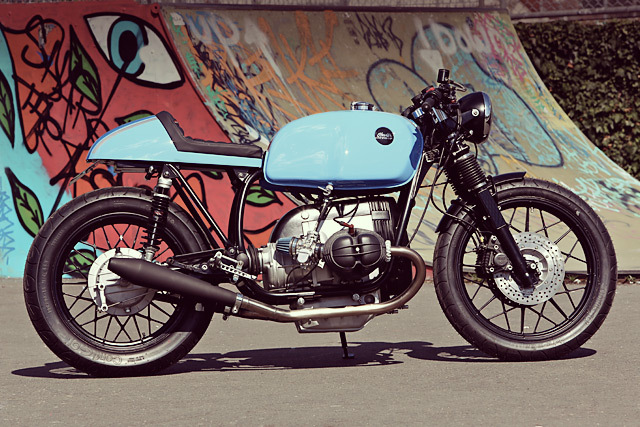 This R80 proved to be no exception, with the old airhead sporting the fit and finish of a bike that has had much more time lavished on it than a mere six weeks. 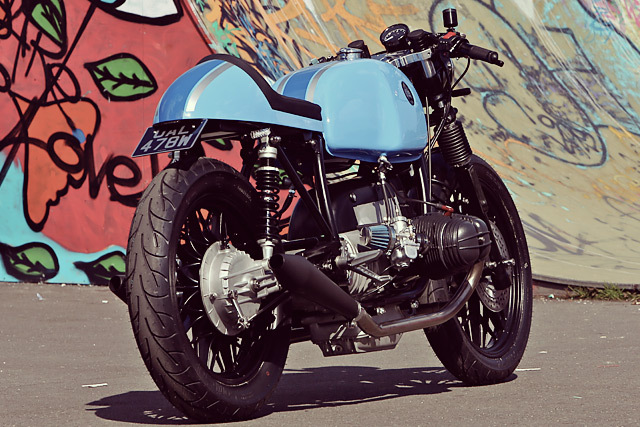 The R80 follows many of the features that you’ll find on Kevil’s other builds. Rearsets and clip-ons move the rider into the classic café racer crouch, the frame has been chopped down and a chunky CAD designed aluminium seat locks the rider firmly into place. All the necessary parts have been powder coated gloss black. Finally, the stance was lowered a little to make Francesca a little more comfortable with her new ride. The whole assembly was finished in a gorgeous bold hue of ‘Jellyfish Blue’, the same colour that was used for Francesca’s 2015 vino labels. 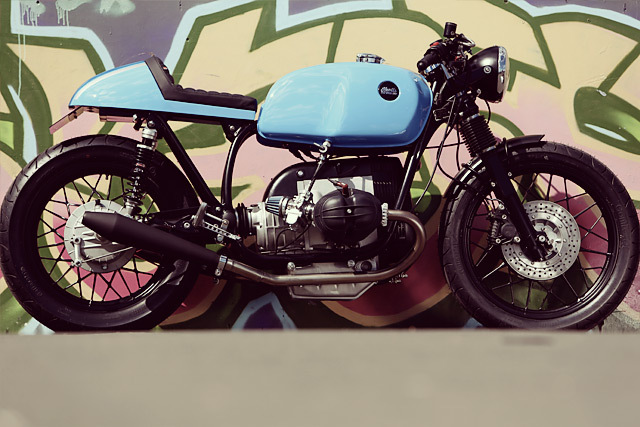 With this old R80 Kevil’s Speed Shop show us that the more things get complicated and convoluted the better it is to come back to something as nicely done as a traditional café racer. That it only took six weeks speaks volumes to the professionalism of Kevin Hill and his team and their expansive knowledge of what can and can’t be done with an old BMW.